A leader plays many roles–visionary, steward, cheerleader, irritant … Irritant? For more on that, we turn to Cindi Bigelow, president of Bigelow Tea. She talks about why her company is the exception to the dismal survival rates for family businesses, and why one key tactic is just getting the right people in the room. A leader plays many roles–visionary, steward, cheerleader, irritant … Irritant? Yup. For more on that, we turn to Cindi Bigelow, president of Bigelow Tea. Bigelow is the third generation leader of the family business based in Fairfield, Connecticut. The 330-person company did about $135 million in sales last year and makes 1.6 billion tea bags annually. In this Q&A, Bigelow talks about why her company is the exception to the dismal survival rates for family businesses, how to push people to exceed their own expectations, and why one key management tactic is just getting the right people in the room. Kermit Pattison: Most family businesses don’t make it to the second generation and only a very small percentage make it to the third. Why has yours survived? 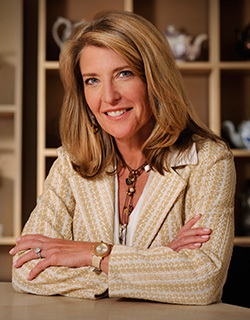 Cindi Bigelow: Our business made to third generation for a combination of mutual respect and love being the foundation to get through difficult times. As long as my parents and I really focused on what’s best for the business, we were able to get through some of the difficult times. And believe me, we had them like everybody else does. It’s nothing more than a sheer hard work and just not letting failure be an option. We needed this and we wanted this business to grow for the 330 families that work for us, and hopefully for the next generation of my family. Were you raised with the idea that leading this company would be your destiny? This morning I was actually at one of the local high schools talking about business and I said to the students, “You don’t need to know what you want to do at 16 17 years old.” But it’s interesting, because I always did. I knew in high school that this is what I wanted to do. I couldn’t imagine doing anything else, to be honest. For me, it’s taking very seriously that you are running a family organization that has a lot of history behind it and a lot of family dedication. But you also have 330 families working for you who are looking at you everyday saying, “Okay, our life is in your hands. We trust you and we know you’re working as hard as you can to make sure this organization will be healthy long term.” For me, leadership is really keeping that in the forefront of everything I’m doing. Absolutely. A family business truly is a gift and you have to work very hard to put your own fingerprints on it. Be who you are, live it, breathe it, be passionate about it. But also understand that you’ve been passed the baton. You need to be planning for the future because eventually you’re going to get around that track and you’re going to have to pass that baton. You are here for a short period of time. You have to do things for the long term and make sure that after you the business is successful. That is leadership to me. What are the typical pitfalls that people get wrong about leadership? When it becomes about you, I think you’re really in the wrong place. When it always is about the business, about the consumer, about the employees and the long term health of the entity, I think you’re in the right place. You’ve really got to put the business in front. It’s natural for you to care so much about the company because its your family business. How do you take inspire employees to care about it too? The first and most important thing is sincerity. Whether it’s an operator on our manufacturing floor or a vice president, they have to really sincerely believe that this is what you love doing and that you are so blessed that they work for you. If you set the right environment and they really believe that you care about them, they’re going to go through walls for you. There are so many different hats that you wear as a leader–you’re a driver, you’re a visionary, you’re a cheerleader. One of them certainly is that you’re an irritant. The vice presidents that work for me know that I have very high standards and an expectation that we always can do better, me included. Some people are inspired by critical feedback and others are crushed by it. How do you challenge people in a way that gets a positive result? It really varies on the individual that you’re coaching. Some, the smallest of nudging and they’re ready to run through the wall, and others you have to be a little more aggressive with. I try to work with each manager with a formula that is the most appropriate and most motivating for them. My style is distinct for each individual that reports to me. It’s finding the right amount of push that’s effective. Some people are so hard on themselves that you really don’t have to go too far. Others are very comfortable, perhaps too comfortable, with what they’re producing–and you have to gently let them know perhaps it’s not as much as they think. I have some individuals that are so harsh on themselves when they make a mistake that I have to let them know that making a mistake is a good thing–we’re going to learn from this, we’re going to get to a better place. I have others who go to great lengths to deny they made a mistake. That’s a problem. What mistakes did you make as a young manager and what did you learn from them? I just finished the MBA from Kellogg and I was really in depth in analysis of our financial departments. I was really spending all the time getting to every single detail possible. There was one individual who looked to me and he said, “You know, if you get in to this much detail in everything you do, you will never move this business forward.” Of course I was insulted. But I really took inventory and I said, “Cindi, you’ve got to blend the detail analysis and also some vision.” I realized that I needed to do a little bit more blending. Let’s talk about cultivating leadership. What do you look for when hiring somebody who will be supervising others? I lean on the team to do the appropriate work. What I say to them is, before you even start interviewing, you need to clearly identify what you are looking for. I really enjoy the whole team environment where each person is challenging each other to be the best, and not to take what we say verbatim but question it and come up with the right criteria, ask in-depth questions of each person you’re interviewing so that you’re really going to be able to ferret out what you want. If they’d done their work upfront about bringing in the right kind of person that we need in this organization, they don’t need me. I hope to just be the rubber stamp. I always say that if you put to the right people in the room, you’re going to come up with some fantastic stuff. So one key to leadership is just getting the right people in the room. That’s right. Giving them these appropriate goals and then letting these guys do their thing, man. They’re going to do it better than I’m going to be able to do individually, that’s for sure. That comes with years of work on everybody’s part. It’s bringing in the right people, constantly working with them, reinforcing our philosophies, reinforcing our goals, working through issues as a team, so we can all learn from each other’s mistakes. My job is challenging them. Are they asking a high enough level questions? In cases where you are intimately involved in the hiring process, what do you look for? The first thing I’m looking is sincerity in what they do. I want to sense that they love what they do, that they’re going to be committed for a long time. And being a good listener. One of the problems you find as you move up in management teams is that some individuals have very strong opinions. I have no problems with opinions, but I want them to be presented in a way that they’re not leaving everyone by the way side. I want sincerity. I want passion and I want the ability to be able to communicate in a way that you going to get people on board. I’m looking for leaders. You’re very passionate about your business. Can employees disagree with you? Definitely, you can have an argument with me for sure. I mean, if you’re too disrespectful, believe me, I’m going to come out of my shoes back at you and let you know that’s not going to work. But I respect it and I always thank someone because it’s not easy to sit down with boss and say, “By the way, I think you really messed up.” When you do get that, you better take it and shake their hand to say thank you or else you’re never going to hear it.